Rhythmbox 0.13.0 "Albatross" has been released yesterday. I've uploaded it to our Rhythmbox backports PPA immediately but only now the package was build (hate you, Launchpad!) 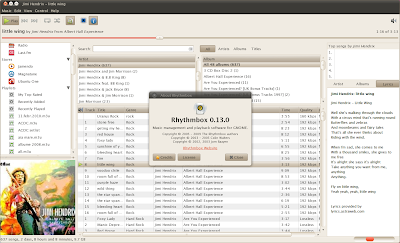 so you can install it in Ubuntu 10.04 Lucid Lynx. A LOT of bugs fixed which you can see here. *Important: because the DAAP plugin now uses libdmapsharing which is not available in the Ubuntu and Debian repositories, the plugin does not work for now, but libdmapsharing will probably be available soon!